In order to function and sustain life, your body requires energy. The body gets its energy from the breakdown of nutrients in the form of carbohydrates, fats and proteins. Carbohydrates are digested and broken down into tiny glucose molecules, the body’s primary source of cellular energy. Glucose molecules are absorbed into the bloodstream from intestinal cells and will always be used as a first source of fuel. Our bodies need a balanced amount of insulin in order to use or store glucose for energy. Excess glucose in combination with insulin is converted into glycogen, which is stored in the liver and muscles for later use. Once glucose supply is depleted, the body runs mainly on fats. Dietary fats, broken down into fatty acids, typically provide more than half of the body’s energy needs and are utilized to help the body absorb and transport nutrients, produce hormones and protect organs. Fatty acids will be used as a second energy source when glucose is in short supply. Fatty acids that the body doesn’t need immediately are formed into triglycerides and stored in fat cells. The human body is exceptional at storing fat. If energy needs exceed those provided by fats in the diet, the body will liquidate stored fats. Although lipolysis generates energy, it requires more oxygen and occurs more slowly than equal carbohydrate metabolism. Proteins, broken down to form amino acids, are used primarily for building new cells, making enzymes, maintaining tissues, and synthesizing new proteins needed for basic bodily functions. When there is a shortage of glucose and dietary fats, proteins can be utilized for energy. Amino acids are not a practical source of quick energy and are typically used by the body only in starvation situations. Metabolism is the sum of the chemical reactions; catabolism, in which molecules are broken down into smaller units to release energy, and anabolism, the process by which the body utilizes that released energy. A total lack of energy or fatigue is one of the main complaints of the general population. Fatigue wreaks havoc on the immune system, making us susceptible to illness and chronic conditions, such as heart disease. Why is it that some people seem to have a limitless supply of energy while others may fall short? Regular exercise, stress management and getting a good night’s sleep are all crucial for fighting fatigue. To keep energy levels at their peak, the body needs proper amounts of complex carbohydrates, lean proteins, and healthy fats. Nutrition directly affects our energy levels, so use nutritious foods for energy pickups throughout the day. Good nutrition, along with timing, can make you feel alert and energized! What’s the answer to the energy question? The answer is simple. Work your body and then reward it with nutrition. Stay hydrated – The body needs water to function optimally. Proper hydration is an easy and effective way to keep energy levels up. Snack smart – Snacking on whole foods can keep blood sugar and energy levels balanced. Avoid energy traps that drain energy such as processed foods or foods high in sugar. There is a big difference between healthy food and empty calories, so you need to eat nutritiously if you want to stave off fatigue. Eat a healthy breakfast – Studies show that eating a nutritious breakfast sets the stage for healthy eating later in the day. To feel alert and satisfied and rev your metabolism, skip the processed carbs and include fresh fruits, whole grains and protein. Don’t skimp on calories – Skip the diet. Just eat healthy. Sustained hunger is not a good choice. To keep energy levels high you need to meet your caloric needs each day. If you are trying to lose weight, physical activity combined with sufficient calories is the key to slow, steady weight loss and a life plan for healthy weight. Include Omega-3’s – Essential fatty acids have many health benefits including increased energy, stamina, metabolic rate and oxidation rate. Omega-3’s help strengthen the immune system and help regulate inflammatory responses. Nutrient dense foods – It’s difficult to sustain energy when blood sugar levels fluctuate to extreme highs and lows. Choose complex carbs such as whole grains, fruits, and vegetables that are high in fiber. Nutritionists recommend three moderate sized meals plus two healthy snacks daily. Optimal energy metabolism requires an abundance of vitamins and minerals to enable our cells to unlock their energy potential. Antioxidants – Whole foods are naturally balanced with complementary nutrients and healthy supporting compounds. Antioxidants can derail damaging free radicals, which can cause fatigue and lead to illness. Substitute green tea for coffee – Coffee provides a temporary stimulant but should not be relied upon as an energy source. Once the short term boost wears off, exhaustion returns, generally followed by hunger. Try sipping green tea for its gentle boost, high concentration of flavonoids and potent antioxidants. Studies have shown that the polyphenols and caffeine in green tea may slightly boost the metabolic rate without raising the heart rate, and may help stimulate fat oxidation. Corvalen M by Douglas Laboratories – Corvalen M ® D-ribose is a natural pentose sugar that is formulated to fight fatigue, and support energy and mitochondrial function. With magnesium and malate to aid in the utilization of energy, to support muscle function and provide muscle soreness relief. Astaxanthin 4 mg by Pure Encapsulations – Astaxanthin is derived from Hawaiian microalgae and is a stable, powerful, fat-soluble antioxidant that supports the skin, macula, joints, immune system and cardiovascular health. Fatigued to Fantastic! Energy Revitalization System by Enzymatic Therapy – One glass per day of this powerful, all-day energy drink mix provides over 50 vitamins, minerals and nutrients that support vitality, health, and lasting energy. Posted on July 3, 2013 | Comments Off on Get Energized! Energy, the essence of life, can be described as the strength and vitality required for sustained physical or mental activity. In nature, energy exists in a variety of forms including mechanical, chemical, heat, electrical, light and nuclear energies. 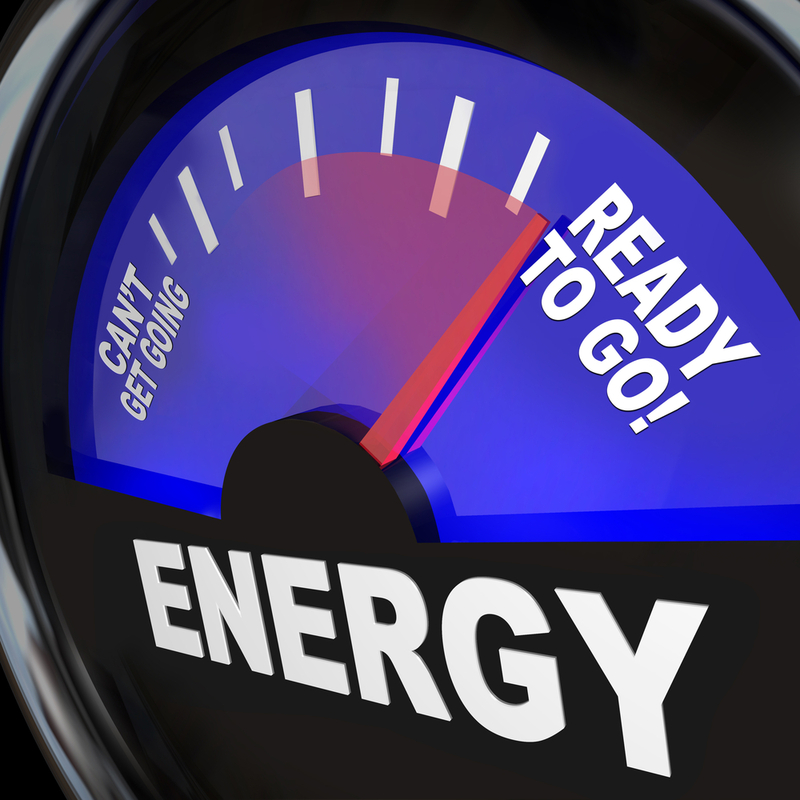 Energy is an indispensable prerequisite for human growth, development and metabolism functions. The human body ranks energy production as the most important of these functions and will sacrifice other functions when necessary, such as slowing down metabolism in response to a lack of food and nutrients. The sun is the ultimate source of energy. Solar energy, when harnessed by plants through photosynthesis, enables the production of plant protein, carbohydrates and fats, all forms of chemical energy. Animals eat the plants and convert the chemical energy into their own stores, primarily protein and fat. When we eat foods from animals and plants, our bodies convert their chemical energy into our own energy for storage and usage. The body uses chemical energy stores to produce the electrical energy needed for creation of nerve impulses, to produce the heat energy that maintains body temperature and to produce the mechanical energy that enables our muscles to contract and release. The foods we eat supply our bodies with energy rich molecules known as macronutrients, and with vitamins and minerals, or micronutrients. The three types of macronutrients, carbohydrates, proteins and fats, are converted during metabolism into glucose or simple sugars (carbohydrates), amino acids (protein) and fatty acids (fats). All of these energy sources are either used immediately or are stored for later use, in the form of glycogen (short-term storage) or fat (long-term storage). When the energy-rich molecules such as glucose enter the cells, they are further broken down in a series of steps that release the energy that drives the complex chemical, electrical and mechanical systems of the human body. Metabolism is the process by which food is transformed into energy. During a series of processes that take place deep inside the mitochondria of the cells, glucose is transformed into adenosine triphospate (ATP). ATP is a complex energy molecule critical for all life, arguably second in importance only to DNA. ATP is the most widely distributed high-energy compound in the human body as it powers virtually every activity of the cells. Within the approximately 100 trillion human cells, each cell will contain about 1 billion ATP molecules. This amount meets the cells’ needs for only a few minutes and must be rapidly renewed and recycled. ATP is a perfectly designed and very intricate molecule that provides the unique amounts of energy required for life sustaining processes. Macadamia nuts – These powerful nuts provide protein, fat, fiber, iron, magnesium and antioxidants. Edamame – These soybeans contain a balance of carbohydrates, protein, iron and healthy fat. Salmon – Always on the list of superfoods, salmon is loaded with energy-promoting protein, muscle-building amino acids, and brain- and heart-healthy omega-3 fatty acids. Kale – The Center for Science in the Public Interest ranks kale as the number one all-around vegetable. Kale contains a substantial amount of vitamins and minerals including a large amount of vitamin K.
Wild blueberries – Packed full of antioxidants, wild blueberries are nutrient dense and low on the glycemic index so they won’t spike your blood sugar levels. Vitamin B1 – Thiamine is essential for converting carbohydrates into energy. Vitamin B2 – Riboflavin aids in the metabolism of carbohydrates, proteins, and fats, and together with Vitamin B3 (Niacin) aids in effective usage of our energy stores. Vitamin B6 – Pyridoxine assists in protein metabolism. For good, healthy energy and vitality, maintain a balanced lifestyle. Eat a variety of vegetables and fruits, stay hydrated with water throughout the day, get regular exercise and make sure you are getting the right nutrients for maximum energy production. Mitochondrial Resuscitate by Metagenics – Scientifically designed to provide nutritional support for healthy cellular (ATP) production by delivering essential nutrients to the mitochondria, the energy powerhouses of the cells. B-Complex Plus by Pure Encapsulations – An exceptional combination of B vitamins, including vitamins B1, B2, B3, B5, B6, B12, biotin, and folic acid (as Metafolin® L-5-MTHF), all of which are provided in their optimal bioavailable and functional forms. Energy/Sports Formula by Douglas Laboratories – A synergistic and comprehensive combination of vitamins, minerals, enzymes, herbals, and other nutrients, carefully formulated and specifically designed to support energy metabolism during sport and exercise. Comments Off on Get Energized!